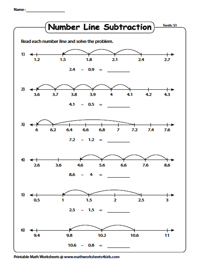 Employ this comprehensive collection of number line worksheets on decimal subtraction for students of Grade 5. These worksheets are an excellent resource for promoting mental arithmetic skills of students. Activities include reading the number lines, drawing hops to show the decimal subtraction, finding the missing decimals and so much more! Click on the 'Free' icon to sample our work. 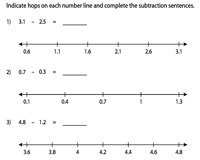 Keenly observe the hops on the number line from right to left to find the difference between the given decimals. Worksheets are classified in accordance of place values up to thousandths for easy access. 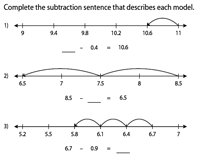 Hop backwards from the larger number to solve the subtraction sentences. Decimal place values up to thousandths are included here. Observe the number of hops, the start and end points of each number line to find the missing decimals. Then, complete the subtraction sentences. 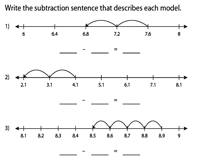 Read each number line and then write down the appropriate subtraction sentences that best describe them. Use the answer key to check your solutions. 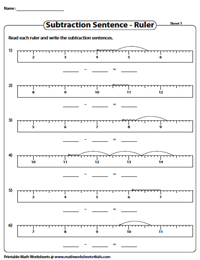 The number lines in this series of decimal worksheets employs the ruler model. Study the hops drawn on each ruler and frame the correct subtraction sentences. 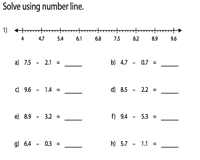 A number line is provided in each worksheet. Use them to complete the decimal subtraction given in both column and horizontal formats.